We bounce around violently as our tuk-tuk tears down the cobblestone streets of Antigua, Guatemala. 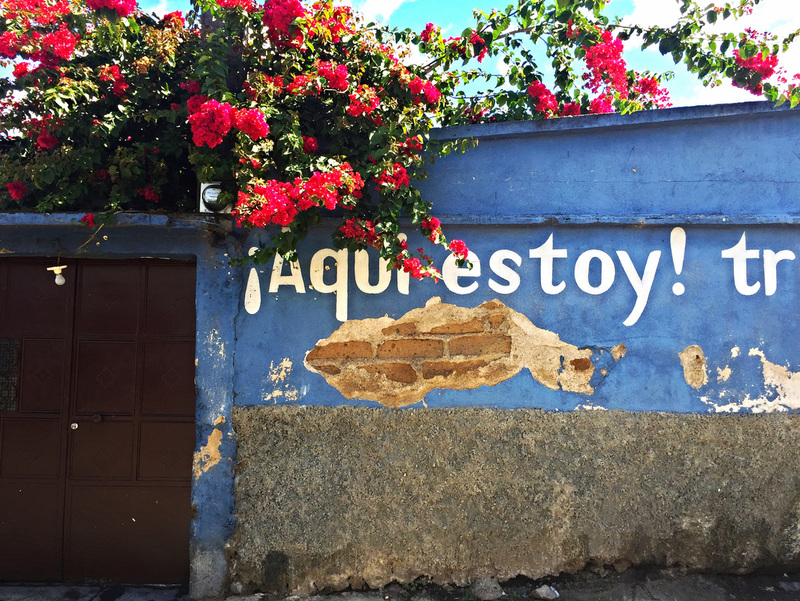 On our way to the neighboring town of San Miguel Cristobal, we meet the team from De La Gente Coffee colectivo in a small main square that fronts a yellow Colonial era church. 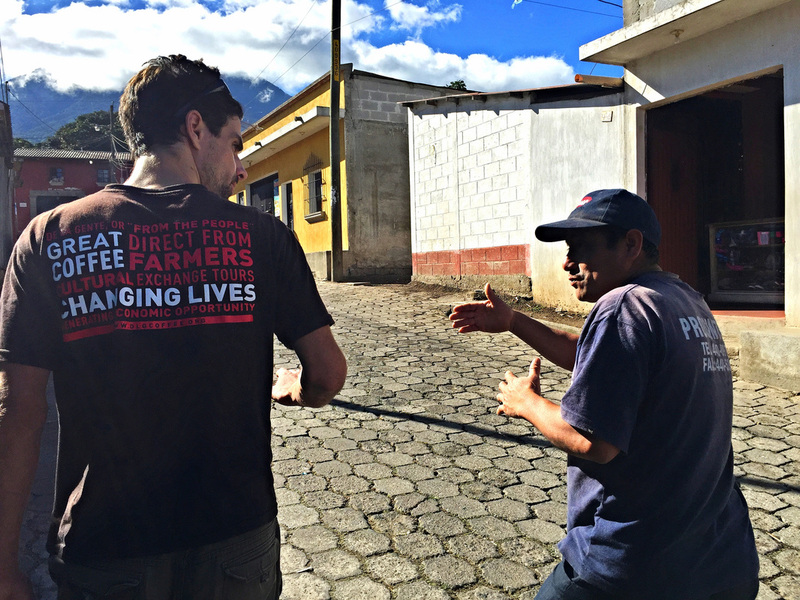 Our guide for the day, Gabriel, is a Guatemalan coffee farmer, born and raised in San Miguel and working with the colectivo to distribute his family's coffee beans. ​We start with a short walk up the hill, to Gabriel’s “string,” 33 square meters of three Arabica varietals. 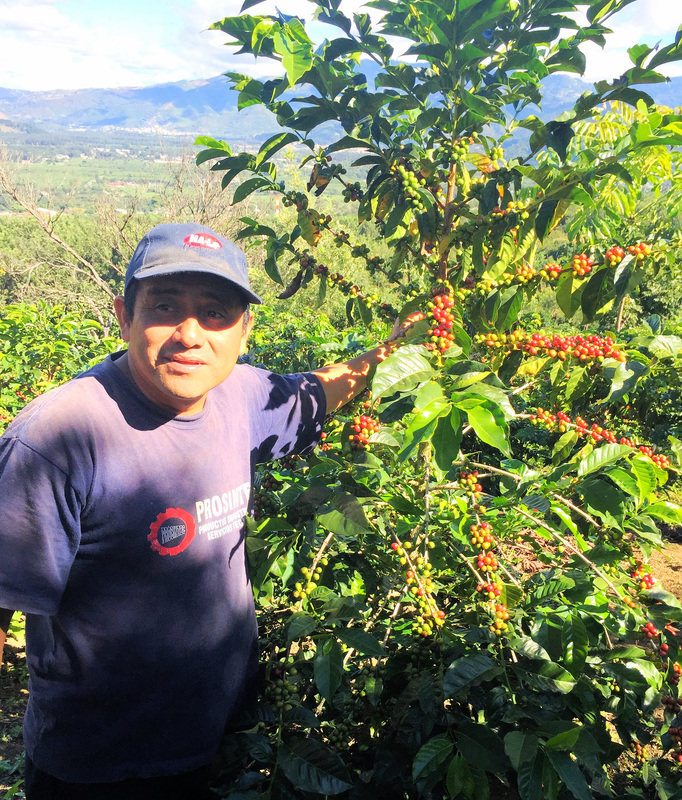 Since joining the colectivo seven years ago, Gabriel has become an expert on every step of the coffee farming process, including farming beans. Learning how the trees are grown, from seed to sapling, to a fully mature fruit bearing plant, we take in each bit of information with eager curiosity. We sample red beans and green ones, tasting the distinct difference between the sweet ripe berry and sour one. 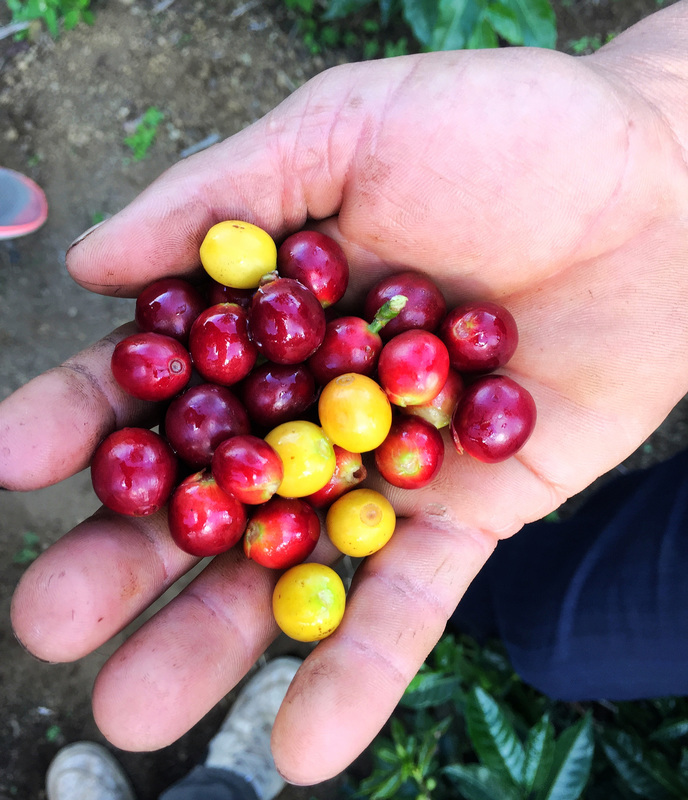 Gabriel shares more details of the often difficult coffee growing process and shows us how to pick the fruit, giving insights to his own personal story along the way. ​Making the short descent back into town, we’re welcomed into Gabriel’s home (and processing plant) by his wife. 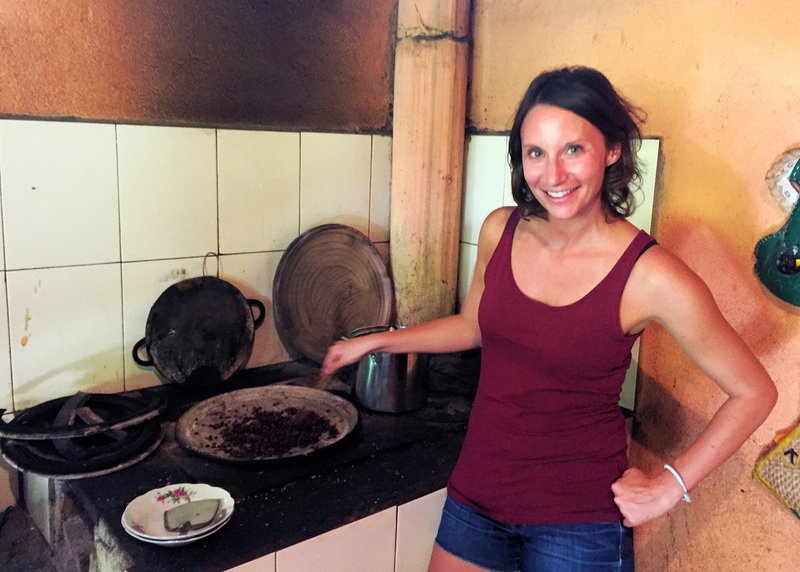 We learn how the ripe fruit we just picked is turned into the perfectly roasted beans sold in nearby Antigua shops. 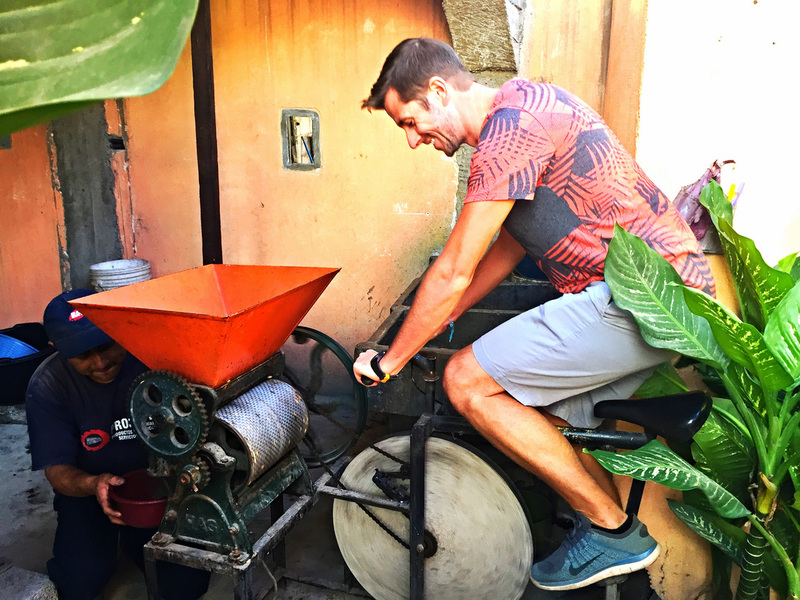 The process starts with the “pulpero,” a grinding machine rigged to a bicycle for manual power, where the semillas (seeds) are removed from the surrounding pulp thanks to some furious pedaling. 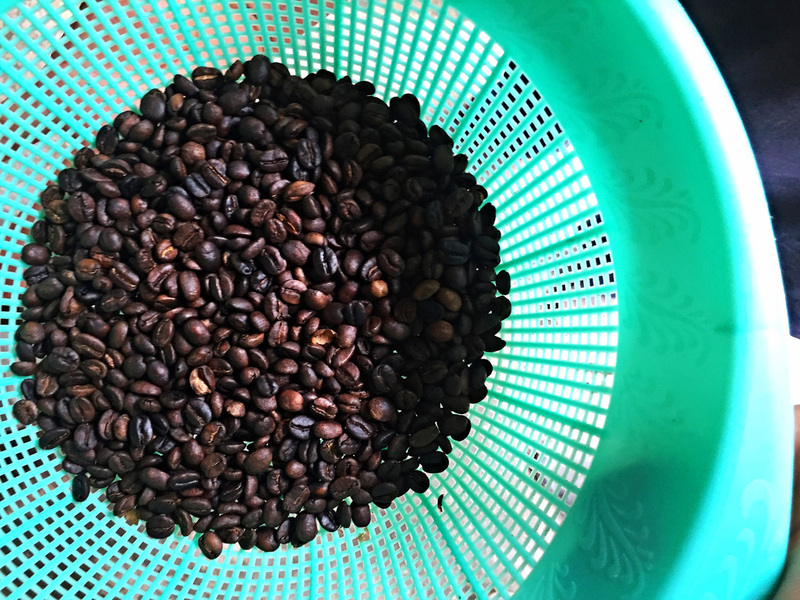 The next steps are to let the beans ferment together in plastic bags for 2 to 3 days, followed by a thorough rinse, then a period of sun drying for another 6-8 days. The hardened “green” beans we now have are ready to be roasted, in this case on the fire heated ceramic stove in Gabriel’s family kitchen. Spreading the beans across the stove top, we carefully move them around so they don’t burn, working toward a dark roast. The difference, Gabriel says, between a medium and dark roast can be as little as 20 seconds of roasting in a commercial roaster. Here, using old school methods, it takes a bit longer. 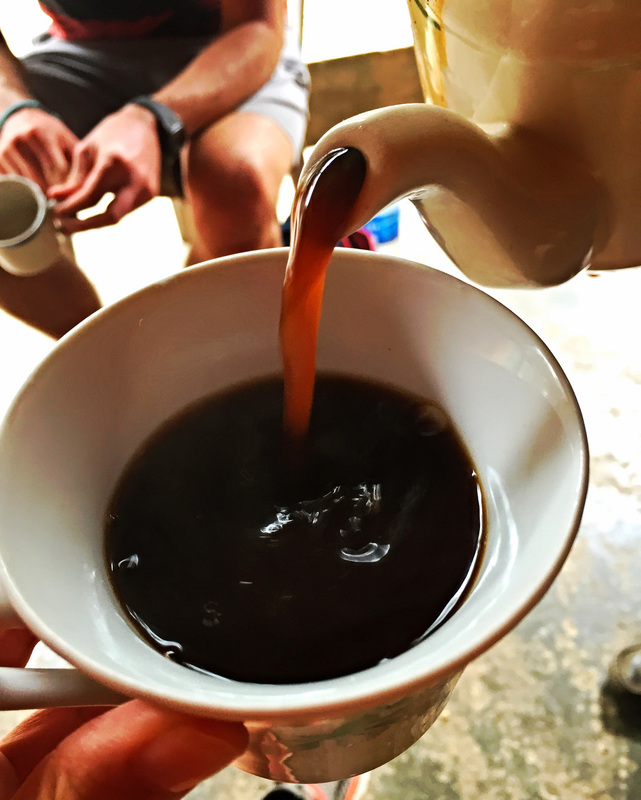 ​The wonderful aromas of the roasted Arabica beans waft through Gabriel’s home and we can almost taste the freshly roasted coffee. 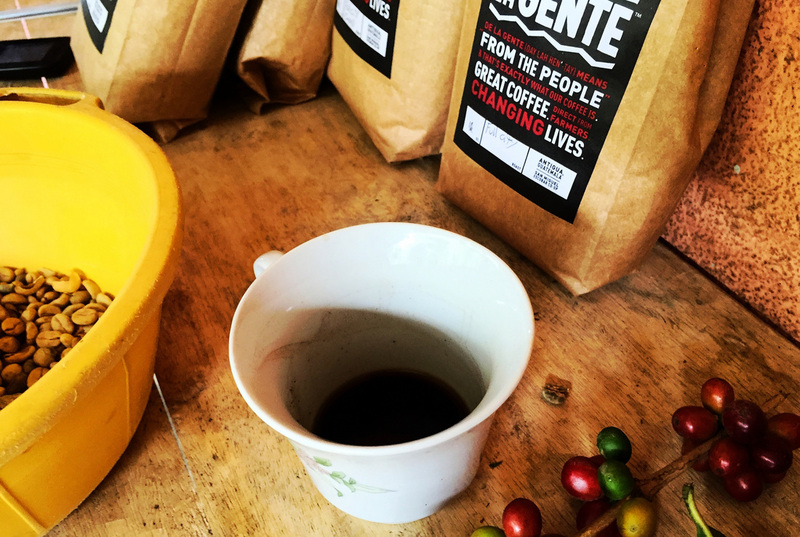 Using a large volcanic stone rolling mortar and pestle, Gabriel’s wife quickly turns the hot beans into delicious grinds, ready to be transformed into homemade Guatemalan cafe, straight from the source. The first sips do not disappoint. The coffee is dark, strong, and surprisingly smooth. 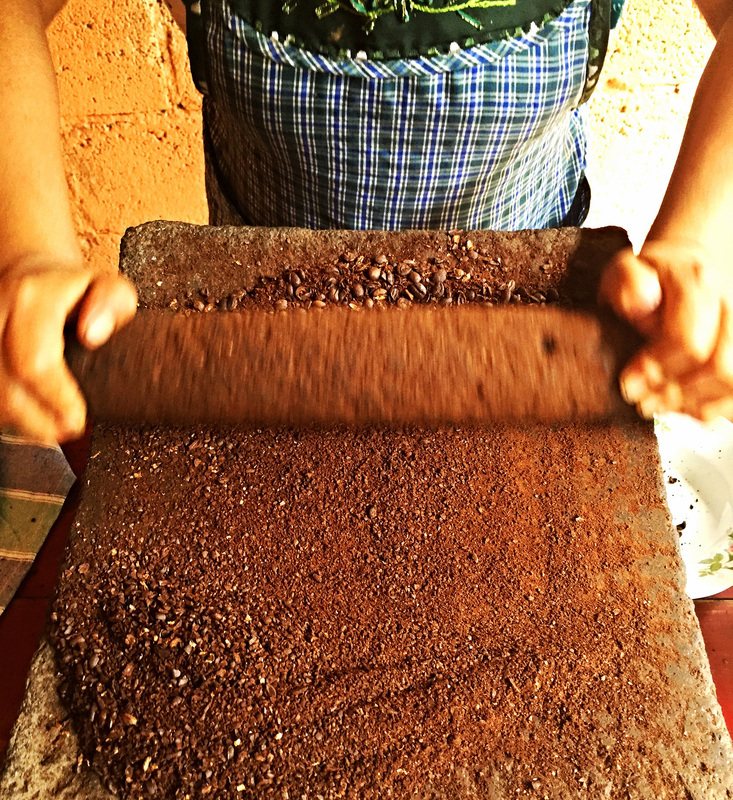 The result, we surmise, of great beans that have been carefully processed and thoroughly roasted, by experts. 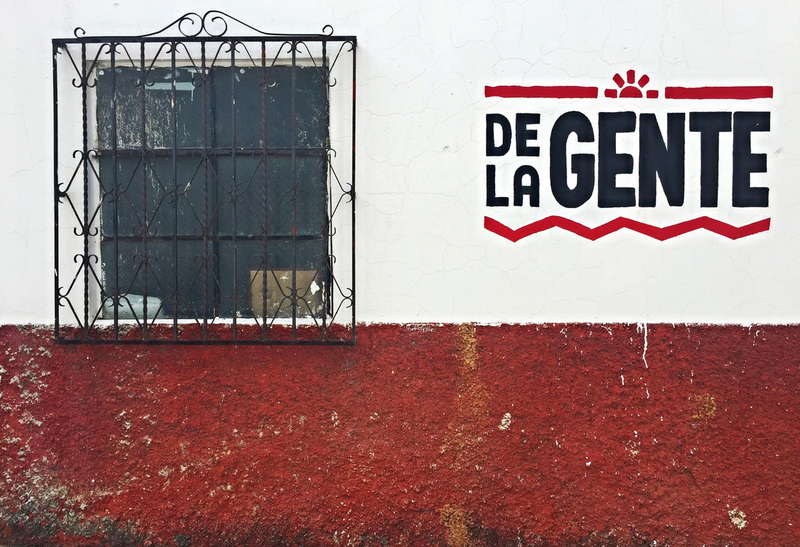 ​As we sit drinking the last of our coffee, Gabriel explains how this colectivo has changed his life and created opportunities for him and his family. Working with De La Gente has allowed the farmers to be direct sellers, in what has long been a rich man’s business. The little money these families had previously made by selling unprocessed beans from their hundreds (if not thousands) of trees, they now process and roast themselves, turning a much larger profit. They have ownership of the product, which is sold throughout Guatemala, in the United States, Canada, and even Europe. Gabriel has enough money to make improvements to his family home and is saving to send his children to university. He wants them to learn English, which means a chance to earn double the salary of the average Guatemalan. These are the literal fruits of Gabriel’s labor, creating opportunities for his family and generations to come.